Powered by 2 AA batteries, the YN560 TX For Canon very much resembles the body of the YN-560 III flash unit. Though its considerably narrower and would be much lighter. the front of the unit resembles a flash body. Its unlikely there will be any AF assist light behind the red lens though. The base of the YN560-TX shows a metal foot with locking pin and full Nikon ETTL contacts. Though these are likely only for the flash wake up feature as the RF-603 II etc have. Provided the specs have not changed, the YN560-TX should be compatible with any camera which has a standard hotshoe. The YN560-TX will support all the major functions of the remote YN-560 III flashes in up to 6 individual Groups. Again the front of the unit resembles a flash body. Its unlikely there will be any AF assist light behind the red lens though. 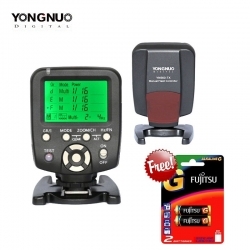 The YN560-TX are NOT directly compatible with YongNuo’s popular YN-622C and YN-622N TTL systems though, or the recent YN-E3-RT transmitter and coming YN-600EX-RT radio enabled flash unit. Though Canon YN-622C users may get away with stacking the YN560-TX on top of the YN-622C pass through hotshoe on the camera, to then fire and control both systems. Once available the YN560-TX should finally unlock the full potential of the very popular and inexpensive YN-560 III flash units, and provide the remote power control many YN-560 III owners have been waiting a very long time for now already. The YongNuo YN-560 III flash units released over a year ago were set to be the first remote manual radio flash units available. As impressive as the YN560-TX looks now for an inexpensive option, they do have some solid competition to contend with now from the Godox V850 and Cactus V6 / RF60, which offer much broader systems.